If you are like me and need a palette cleanser between your sweaters or monster shawl projects, then you've got to knit these. 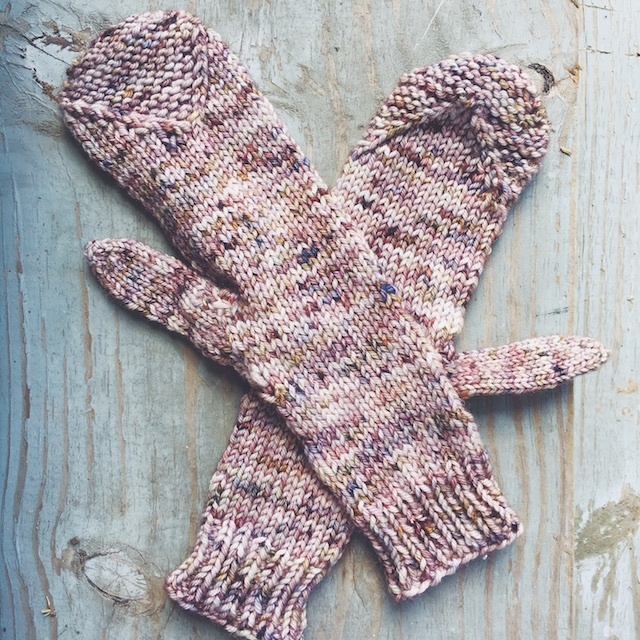 The Laura + Maddy Mittens, by Teresa Gregorio, are one of the designs from the upcoming Great Northern book that she and Leah Coccari-Swift are writing, influenced heavily by Twin Peaks. Like their namesake, these mittens are the same, but different. 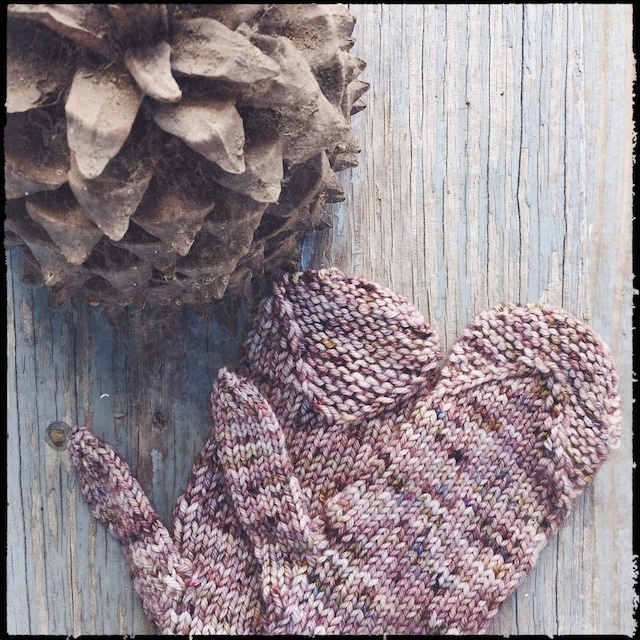 I loved working the peaks and valleys at the fingertips of the mittens, especially since I was using a worsted yarn. Worsted is the new bulky, so this project just flew off of my needles. Then, there's the extra long cuffs that I opted to make. I have no gloves or mittens like that, so I think I'll appreciate it on evening walks this winter. Also, there's that soccer tournament that always seems to be scheduled for a freezing, rainy weekend. Besides all of that, I just have to admit that I'm a sucker for themed knitting stuff. There's movie and tv themed knits, like the Great Northern book, which I'm sure I'll want to knit from cover to cover. Then there's yarn collections named for shows, people, and things I like. The very yarn I'm using for these was inspired by Stranger Things. I've always snorted at that sort of fandom, but that doesn't keep me from clicking the Paypal button as I do it. So the left mitt is to the right mitt as Maddy is to Laura- basically identical, but with glasses. 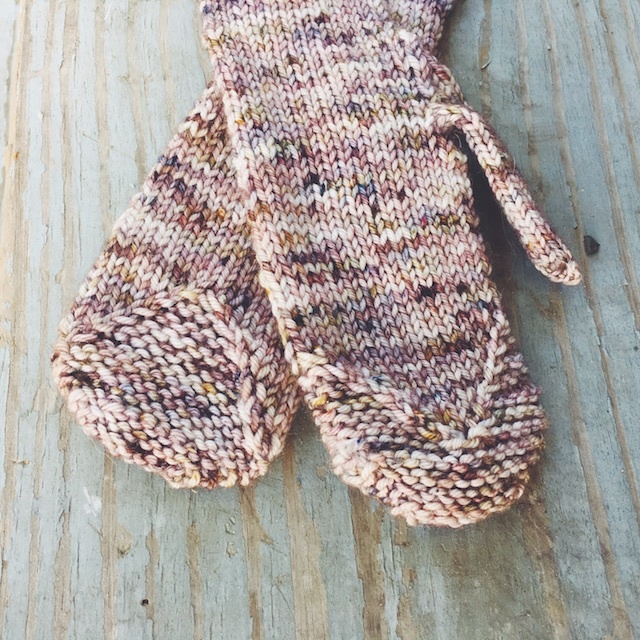 Details: I used size US 5 circulars to knit these in magic loop. I did, however use double points for the thumb. 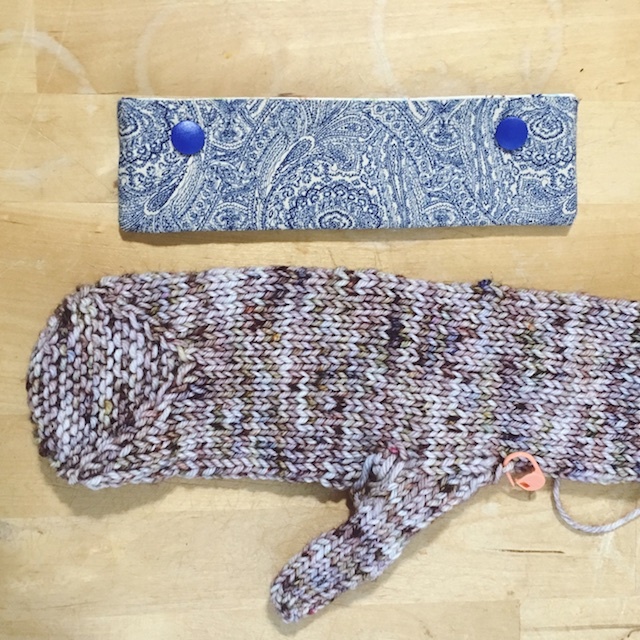 I've only knit two pairs of full mittens, but this construction was really different. I liked that I could do everything topdown, even the thumb, and be sure it all fit just right. And these are the best fitting mittens/ gloves that I own. I would love to include a photo of me wearing them but all of those were total crap and I looked drugged in them. So, you'll have to trust me. The thumb gave me a chance to use a double point holder for the first time. This one looks like book endpaper and has due date-stamped fabric inside, from Amanda Makes Yarn. It absolutely saved my sanity because the needles kept wanting to shoot out of the thumbs every time I set it down. Oh, and the yarn! 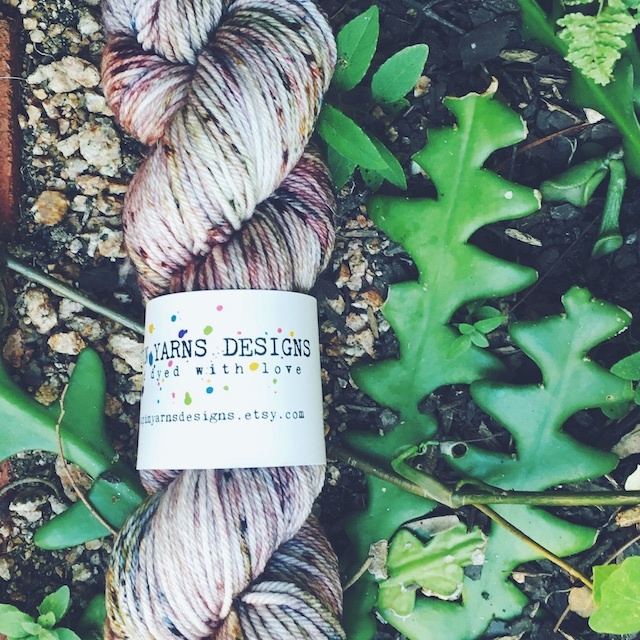 I adore this speckled Murkwood colorway from Up in Yarns. As I mentioned, it was inspired by Stranger Things. It's also the perfect compliment for these mittens. Colorful, without being a distraction. I think the texture at the fingertips looks really nice worked up in this. At this point, I think there are seven patterns from Great Northern available as individual downloads. I had to have the book for all the reasons I rambled about here, so I contributed to the kickstarter and have so will have the digital patterns, as well. The whole project will be available to buy soon, though. Twin Peaks calls up so many memories and crazy images to my mind, the most recent of which is that of my grandmother's retirement home bringing a group of very senior ladies to the Twin Peaks restaurant, of which they knew nothing, for lunch. They were not amused, but we have gotten a lot of mileage out of the story. Teresa is one of my favorite designers. Obviously, I like her design style. I scrolled through my projects on Ravelry and counted seven knits from her (Cherry Pie and Beach House are the most recent.) But, I also think she is a really interesting person. 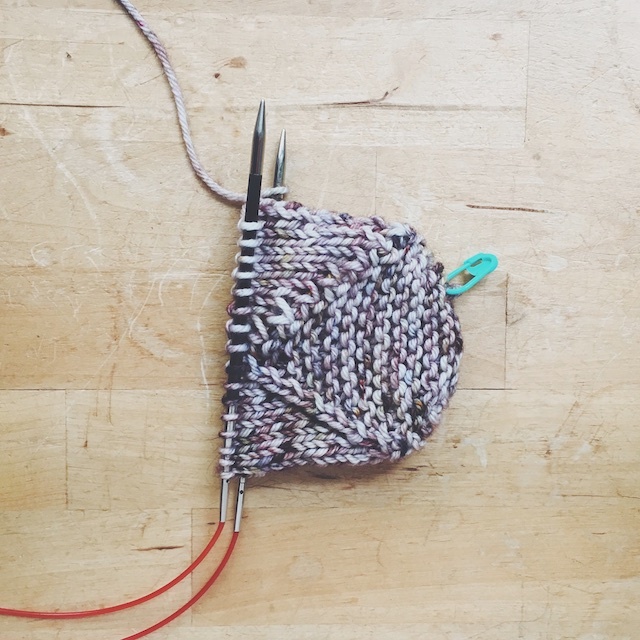 Like Libby's podcast that I mentioned yesterday, Teresa's Canary Knits Podcast, is one of my very favorites. They're short, but sweet, episodes that always get me to think about my crafting. 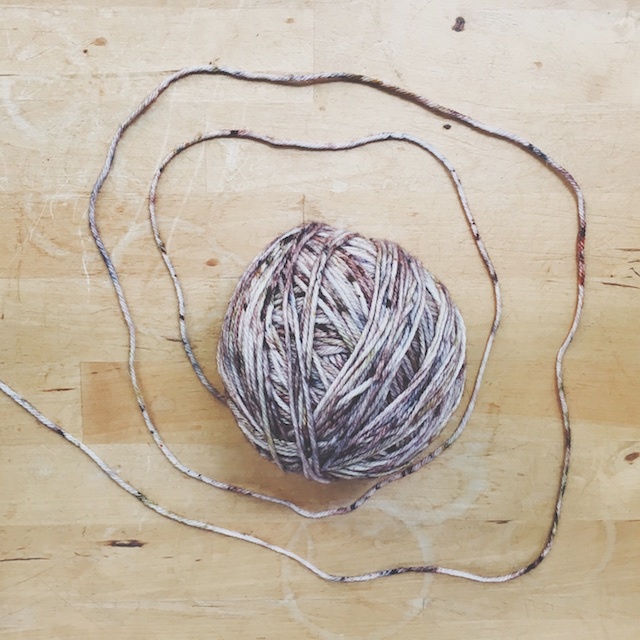 I always want to do something, mindfully, when I'm finished listening. Plus, I'll never get over how creative her Ghosts ebook is. So, which of her designs will I knit next? I have the yarn waiting for Harris, eventually. Leeto looks cool and like it would be fun to knit over a weekend. Draperie is another one I love, worn both ways. Solstice Stag, an older design, is a classic Fall cowlneck. Not to mention the Drift's Ridge I still have on the needles, waiting to see if I will ever fit in it again. You can behold it's beauty here. It truly is a classic sweater shape that will never go out of style, and I love the Charlemont. It's not that I'm completely unrealistic about the likelihood of it fitting again, it's just that, guys! That was the most perfect colorwork I've ever knitted, and on tiny little needles, with tiny little yarn. I'm sentimental to a fault. I think Kat and Estivate would be very sensible for me to knit because I could wear the heck out of them. But, From Another Place, which you can see a test knit of here, is the one I long to knit next. Oh, and Jelly Donuts!! Cableses and toggleses!!! Ah, I can't wait for Great Northern to be released.